HomeWomen in Touch Members – SCV Feb Meeting – Visitors Welcome! 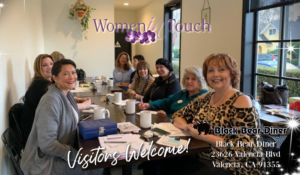 Women in Touch Members – SCV Feb Meeting – Visitors Welcome! All Women in touch members are invited to join so we can help each other achieve our goals. If you are not a member and would like to have a trial visit at this meeting, please send a message to Jennifer@WomeninTouchSCV.com.